The Pro-Q compact Reverse Osmosis (RO) water system features twist-off cartridge design, enabling easier cartridge replacement and the replacement procedure is sanitary, meaning no hands are touching the filtration media. The RO Module consists of five stages complete with filters and an RO membrane. The quick change (Pro Q) system means no tools are needed (e.g., wrench) to change the filters. 1st Stage: 5-micron Sediment Filter QSF-25003, disposable, replace every 12 months). This filter removes sand, silt, clay and dirt, providing clean clear water, protecting and increasing the service life of the remaining filters. 2nd Stage: GAC Filter QGA-25002, replace every 12 months). This carbon filter is made of high quality activated carbon. It reduces chlorine taste and odors and removes organic matter. 3rd Stage: 10-micron Carbon Block Filter QCB-25001 (disposable, replace every 12 months). This carbon block filter is made of high quality activated carbon. It reduces chlorine taste and odors and it conditions the water before it is treated by the reverse osmosis membrane. 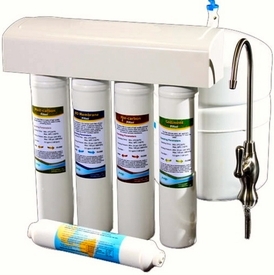 4th Stage: 50 GPD Reverse Osmosis Membrane Filter (disposable, replace every 24 months). This TFC membrane removes impurities, contaminants and up to 95% of dissolved solids. 5th Stage: Inline GAC 2"x10" (replace every 12 months); provides final polishing of water. The System comes with lead-free fancy brass faucet with chrome finish, 3.2-gallon pressurized tank, color-coded tubing, and an installation pack. The installation pack includes tank ball valve, feed water valve, drain saddle, inserts, tubing and screws in addition to the installation manual. NOTE: THE MANUFACTURER (PUREGEN TECHNOLOGY) DOES NOT ACCEPT ANY RETURNS. SO ANY POTENTIAL CUSTOMER SHOULD UNDERSTAND THAT NO RETURNS ARE ACCEPTED ON THIS RO SYSTEM. COMPARE TO HiQ Reverse Osmosis System (ROQ5-50F).